The food system faces increasing pressure from dynamic and interactive, environmental, political and socio-economic stressors. Tackling the complexity that arises from such interactions requires a new form of 'adaptive governance'. This paper provides a review of various conceptions of governance from a monocentric or politicotechnical understanding of governance through to adaptive governance that is based in complex adaptive systems theory. The review is grounded by a critique of the existing institutional structures responsible for food security in South Africa. The current Integrated Food Security Strategy and tasked governmental departments are not sufficiently flexible or coordinated to deal with an issue as multi-scalar and multidisciplinary as food security. However, actions taken in the non-governmental sector signal the emergence of a new type of governance. Apart from an increasing recognition of food security as an issue of concern in the country, there is also evidence of a changing governance structure including collaboration between diverse stakeholders. We review these governance trends with an understanding of the food system as a complex adaptive socio-ecological system where actors in the food system self-organize into more flexible networks that can better adapt to uncertain pressures. Ackerman, G. (2011). Ensuring Africa’s food security needs a sustainable approach, Johannesburg: Pick n Pay. Available at: http://www.iol.co.za/business/opinion/ensuring-africa-s-food-security-needs-a-sustainable-approach-1.1173389 [Accessed November 20, 2011]. Beddington, J. (2009). Beddington: World faces “perfect storm” of problems by 2030 | Science | guardian.co.uk. Guardian.co.uk. Available at: http://www.guardian.co.uk/science/2009/mar/18/perfect-storm-john-beddington-energy-food-climate [Accessed December 17, 2009]. BFAP (2010). The South African Agricultural Baseline, Pretoria: Bureau for Food and Agricultural Policy. Available at: http://www.bfap.co.za/FINAL%20Agricultural%20Outlook.pdf [Accessed December 18, 2010]. Competition Commission (2010). Commission appeals bread cartel penalty, Johannesburg: Competition Commission. Available at: http://www.compcom.co.za/assets/Uploads/AttachedFiles/MyDocuments/Commission-appeals-bread-cartel-penalty.pdf [Accessed March 22, 2010]. FAO (2008). OECD-FAO Agricultural Outlook 2008–2017”, February 2008. Available at, OECD/FAO. Available at: http://www.agri-outlook.org/dataoecd/54/15/40715381.pdf. GECAFS (2011). Global Environmental Change and Food Systems - GECAFS. 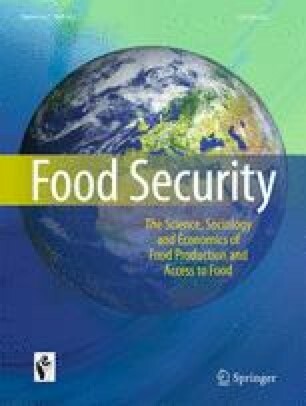 Global Environmental Change and Food Systems: A food-secure future for those most vulnerable to environmental stress. Available at: http://www.gecafs.org/ [Accessed December 5, 2011]. Heinrichs, T. (2006). On the Role of Scenarios in GECAFS Decision-Support, Available at: http://www.gecafs.org/publications/index.html [Accessed November 22, 2011]. Ingram, J. (2011). A food systems approach to researching food security and its interactions with global environmental change. Food Security. Available at: http://www.springerlink.com/index/ 10.1007/s12571-011-0149-9 [Accessed December 5, 2011]. Mathekga, R. (2006). Participatory government and the challenge of inclusion: The Case of Local Government Structures in Post Apartheid South Africa. Colombia: Colombia Internacional. Available at: http://www.scielo.org.co/scielo.php?pid=S0121-56122006000100005&script=sci_arttext [Accessed May 14, 2010]. Rep. South Africa (1996). The Constitution of the Republic of South Africa, Pretoria: Government Printer. Available at: www.info.gov.za/documents/constitution/index.htm. Watkinson E. (2003). Overview of the current food security crisis in South Africa, National Labour and Economic Development Institute (NALEDI). Available at: http://www.sarpn.org.za/documents/d0000222/watkinson/Watkinson_SA_food_crisis.pdf. [Accessed December 5, 2006]. Woolworths (2009). The Good Business Journey, Annual Report, Woolworths Holdings Ltd. Available at: http://woolworthsholdings.co.za/downloads/whl_good_business_journey_2009.pdf [Accessed January 10, 2012].